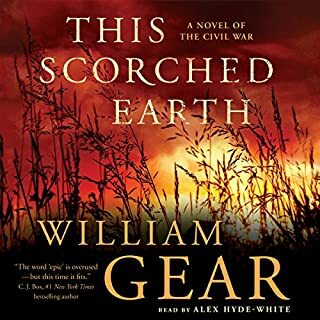 Alex Hyde-White does a masterful job conveying the emotions William Gear so skillfully renders in this American Civil War epic. The Hancock family of Northwest Arkansas was experiences the gammet of Civil War trauma from major battles, caring for the wounded, prison camp, partisan raiding, lawlessness, and other, more personal atrocities. The story is a study in human ability to cope (successfully and unsuccessfully) with the trauma the characters experience. Human traits from hate to love, greed to sacfrifice, murder to healing are demonstrated through intricately woven descriptions of environments and human interplay. Alex Hyde-White brings William Michael Gear's tale to life in a manner that makes the listener a first-person witness to the action. The work is a Must Listen!